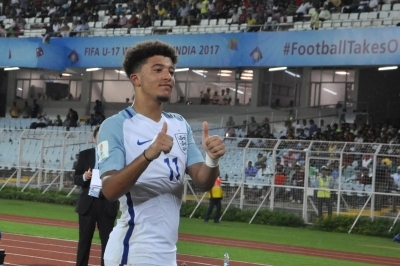 Kolkata, Oct 8 (IANS) England chief coach Steve Cooper is not fretting over the likely absence of attacker Jadon Sancho after the group stage of the FIFA Under-17 World Cup, saying the team is not thinking beyond the preliminary round at the moment. “All of are here for the group stage at the moment. We need to qualify (for the knockout round) first. We are not thinking of anything else until we get out of the group stage,” Cooper said when asked about Sancho’s status after the group stages. Sancho, who plays for German football giants Borussia Dortmund, was outstanding on the night netting a second half brace and providing the assist for the opening goal. The highly-rated attacking midfielder bossed the left wing and was also seen playing in the middle of the park during the first half. 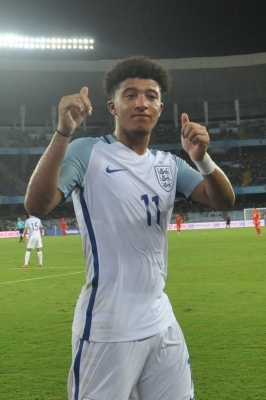 Sancho was taken off in the 77th minute but by then the damage was already done as England led 3-0. Later, substitute Angel Gomes rounded off the scoreline with a brilliant freekick in the 81st minute. Sancho is expected to join Dortmund with the club wanting his services after the ongoing international break. “Nobody’s going to get carried away with the win. Now we need to get the plan right for another really good test and recover well. It would be naive to look beyond the group stage now,” Cooper said after their convincing result. Callum Hudson-Odoi scored the first goal in the fifth minute. “It’s a good scoreline 4-0. I think the biggest plus tonight is sometimes we forget the age of the players and in an occassion like this the way they handled it and got the result, great credit to them. We controlled the game from start to finish,” he said. “We played in the style that we want our England teams to play with. We got the result that we intended to get, so lot of positives from the game. We have scored some great goals but equally we kept a clean sheet,” the coach said. Cooper stressed on the importance of goalkeeper Curtis Anderson keeping a clean sheet. “Goal difference can make a difference in group stage in a tournament like this. They were many aspects of the performance we were pleased with. The zero in the scoreline is as important as the four goals,” he said. England next take on two-time champions Mexico on Wednesday.